I'm a firm believer in treating yourself, especially when it comes to skincare. Never do I feel guilty about spending money on quality products that I know my skin will benefit from. 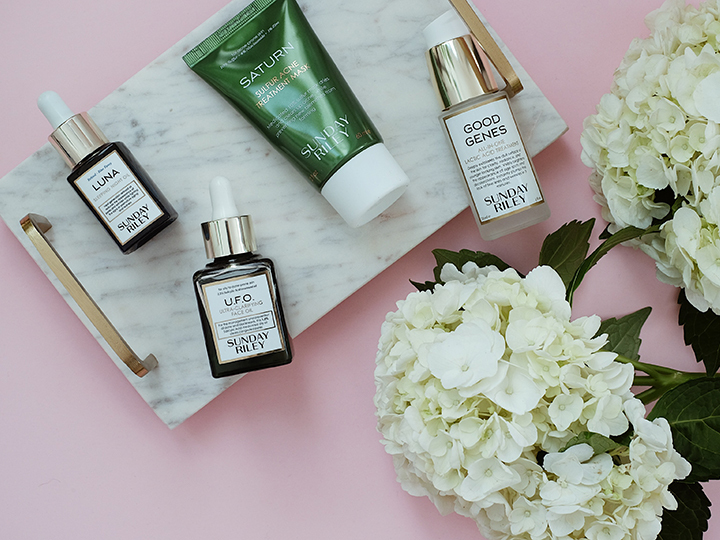 Recently, I shared the top 10 products in my beauty bag, one of them being Sunday Riley's Luna Sleeping Night Oil. As mentioned, this oil single-handedly is the reason why my skin has never looked better. Impressed by the Luna Sleeping Night Oil, I decided to give Sunday Riley's other products a try as well. My 2 main focuses/concerns when it comes to my skin are acne breakouts and anti-aging. Because of this, I was instantly drawn to a few specific products. U.F.O. (Ultra-Clarifying Face Oil): Sunday Riley has dispelled my preconceived notion of oils breaking out my skin. I switch between U.F.O. and Luna, depending on the time of month and how my skin is feeling. I tend to use U.F.O. during "that time of month" and/or when I've been making poor food choices and know that I'll be paying for it in the form of a breakout. The oil is green, but becomes translucent once it's applied. It's a quick-absorbing, medicated oil that contains 1.5% salicylic acid. Not only does it clear up my congested pores and treats (as well as prevents) acne, but it also smoothens the appearance of fine line and wrinkles. Good Genes (All-In-One Lactic Acid Treatment): This bad boy is called "Good Genes" for a reason. It is seriously AMAZING. Not only does it exfoliate dull skin cells for fresher skin, but it also plumps fine lines and reduces my acne scars. Good Genes is a new holy grail skincare product for me because of how transformative the results are. Saturn (Sulfur Acne Treatment Mask): I love face masks, but often times find them to be ineffective or drying. That's definitely not the case with Saturn. This is a fast-acting treatment mask that contains 10% sulfur, which helps to fight multiple forms of acne. It's super effective and calms down my breakouts almost immediately. The texture is lightweight and a little goes a long way. I use this 2-3 times a week and it works wonders. Let me know if you've tried any Sunday Riley products and which ones are your favorites. I'm looking to expand my collection because honestly, I've become obsessed.